As the world of #Austenesque writing matures, authors are now beginning to explore ways to elevate the experience of their supporters. The most apparent manner (as the Seattle-based behemoth continues its inexorable march) is the move from the printed/electronic word to spoken word. Fun fact: In the United States, The National Academy of Recording Arts and Sciences has awarded a Grammy for spoken word performances since 1959. Audio books are now included, although Barack Obama reading his latest is likely to win! Transitioning any work to an audio version does require a degree of financial commitment on the part of the author, and this simple fact must necessarily reduce the number of books being transferred to this medium. Obviously, a book which has received marginal notices from the reviewing population may not be worth the out-of-pocket exposure incurred by an author. Likewise, “pulp” works may require too much repair work (time and patience) to bring them into shape for recording by a professional. Much as the traditional publishing model filtered out weaker entries, so too does the demands of audio publishing in today’s day and age. Many works in the old JAFF world and now the new #InspiredByAusten realm still follow the traditional “audiobook” model: in other “words,” delivering a faithful rendition of the work to engage a different sense of the “reader,” that of hearing. However, there are many newer, more media-savvy writers who are discovering that there is more to creating an audio version of their existing book than simply sending the manuscript to a voice talent. For me, I discovered this gap between what has been the expectations of the marketplace and what can be the possibilities. 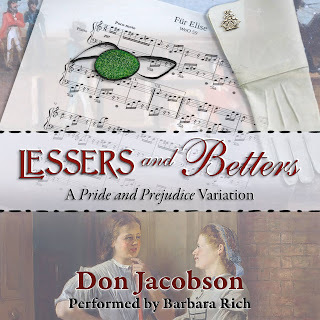 That “eureka moment” came when I was working on the “covers” for the Audio Versions of my books (The Bennet Wardrobe Series and the Lessers and Betters stories). T’is rooted in how I write. 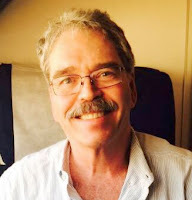 I spent nearly 40 years writing advertising copy, radio and television commercials, and video scripts. Thus, my composition style grows out of the visual. I “see” my scenes before I “write” my scenes. Thus, I am perforce always describing action, expression, and attitude. The words recreate the visual that I imagined. One thing I knew about these incredible people is that they have undergone years of training to hone their instruments to a fine point. They are also very proud of their capabilities. Were they simply going to be “narrators?” Or, would they be my partners in continuing the act of creation by adding to what had already been brought to the printed page. Thus, I offered them a choice…”Performed By” or “Interpreted By.” To a soul, they picked “Performed by!” And so they have. By releasing the fetters that had semantically held back their active participation in bringing the works to a new level—one which inspires the listeners’ imaginations, the alteration of the word “Narrated” to “Performed” sends the work down a new course. And, as such, I believe that my works are all the better for it. Oh, and, as an author, I did discover while going this process that what works on the printed page may not work when performed aloud. Thus, the audio versions of my books are slightly different because of necessary edits. Miss Bennet glanced back over her left shoulder at Henry, and with a smile to him, indicated that she wished a glass of champagne from his tray. He stepped forward and bowed slightly so that she could take her drink. Looking past, he saw a tall, slender, red headed woman making a beeline for Miss Bennet from across the room. To Wilson’s eye, this woman was at least five and more likely ten years older than Miss Bennet. As she neared her quarry, he could see that her complexion was well rouged and powdered, probably in an effort to restore the luster of a youth that had fled some time before. More likely, all she accomplished was to hide some of the more obvious ravages of time. She was dressed as good Queen Bess, but the ridiculously accurate high collar coupled with her already long frame left an impression of a carnival actor navigating the room on stilts. Henry could see a steely glint in her hazel green eyes. Whoever she was, she bore not friendship, but rather disdain, for Miss Bennet. Wilson stepped back to his earlier position, making sure to keep his face impassive. I think I am about to see how ladies do battle. These two have no love lost whatsoever. I doubt if this Miss Bingley—how did she ever secure an invitation, I wonder—is aware that Miss Bennet spent the last few years by the side of a Cecil, and a future Duchess at that, learning the art of social war! The faux-Elizabeth arched her eyebrows as she absorbed the slight about her marital status. Then she tried a flanking attack. Wilson ground his teeth as he listened to Miss Bingley pile insults atop insults. He had heard Miss Bennet relate to Annie that her uncle had not demanded that any of his nieces find employment. On the contrary, her two elder sisters could not bear to be a burden on a household with four small children. Another sister—the middle one—had married a sea captain in the Gardiner line. His share of the profits would make the couple quite comfortable. Miss Bingley fired another shot, “I can give no credit to your account. I am surprised that Lord Thomas Cecil would be willing to meet with anyone from trade here at Cecil House. Why even my brother, for whom I am still hostess, has the delicacy to conduct those sorts of meetings away from home. And, when I am Mistress of Pemberley, I will force Mr. Darcy to cut any ties with those in trade. His man of business is good enough for that! This last vitriolic salvo was delivered with the triumphant sneer so well known by familiars of that particular daughter of trade. She then sought to push her advantage home. Dropping all pretense of being polite, Miss Bingley reached out and grabbed Miss Bennet’s dance card that was dangling from her left wrist; the same hand in which she held her glass of champagne. The remaining liquid splashed out onto the floor as Miss Bennet’s hand was yanked forward. Henry stepped forward to Miss Bennet’s side. He had already lifted the napkin draped over his arm and had dropped it atop the golden puddle before it spread to the hem of her gown. Then he gently removed the glass from her hand, still held captive by the silk ribbon stretching from her wrist to Miss Bingley’s hand. He glanced at the governess’ face. Oh, this Bingley woman has overcharged her musket like a raw recruit. Wonder if she left the ramrod in as well. There is going to be an interesting explosion in a moment. Just look at the arch of Miss Bennet’s eyebrow and the set of her lips! Caroline snapped open the card. Then her face began to grow pale for the card was filled with names that could only have been improved if one had been the Prince Regent’s! 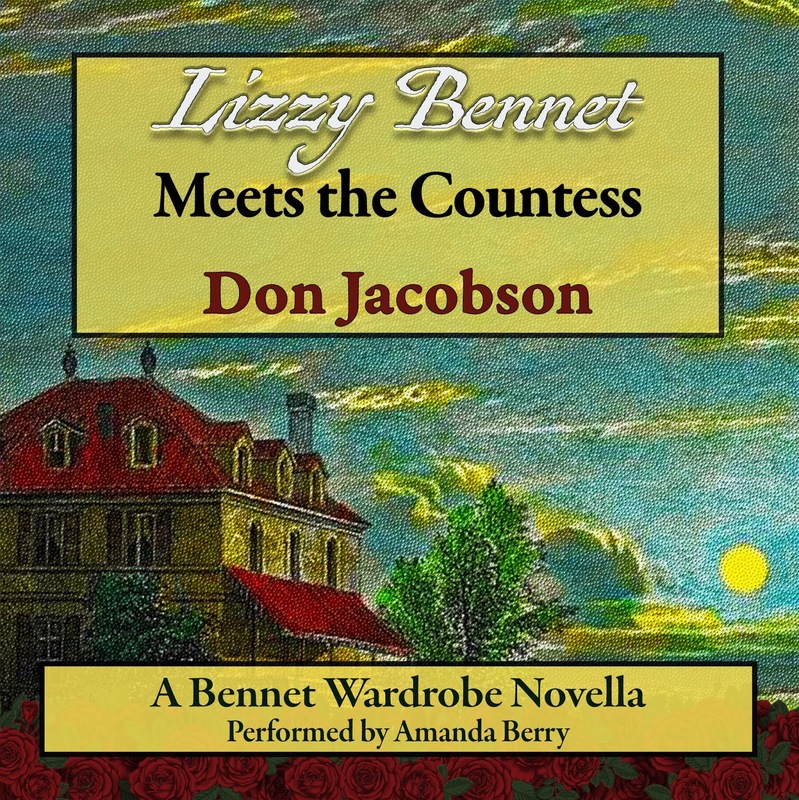 Don is here to share some audio love; and so he has kindly offered to give away an audio code for two of his books - Lizzy Bennet Meets the Countess and Lessers and Betters to TWO winners - so two packages of two audios. To win, just comment on this blog post by the end of the day on Friday 3 August. Thank you so much to Don for the guest post and giveaway! Look forward to engaging with all of your comments. Traveling tomorrow, so may be a bit delayed in response! Thanks so much for the post, Don! It's an interesting idea to change the text so it works better in audio. I was recently reading a factual book which referred back to a sentence at the beginning of the chapter, which of course, listening to the audio I never got back to, and I wished they'd had the common sense to realise that it's a different experience and should be tweaked for the listener. You're right Ceri! Every means of communication has its way to express itself at its best! My first experience to listening to audio was with Don's "Henry Fitzwilliam's War". The performance by Amanda Berry, the narrator, was excellent and I look forward to listening to more. I have downloaded audible on to my computer and will listen to both of these in the coming months so please do not enter me in the giveaway. As I also own all Don's books, the idea of reading along while listening is excellent one. I'm so new to this form of 'reading/listening' that I think I need more time to see if it truly works for me. Thank you! As always, Carole, thank you so much for your supports and comments. Will be leaning on Bert for colloquial German translations for the next "The Avenger: Thomas Bennet and a Father's Lament." Hi Carole, wanted to introduce myself and say thank you for the kind words! I'm working hard to get the rest of the books out to you and hope you enjoy listening as much as I did performing! 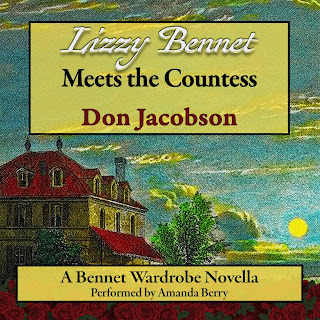 I currently have the sample for Lizzy Bennet Meets the Countess up on my website too if you were interested in checking it out! Hi Carole! Glad to know that you've enjoyed this narrator/performer. I know what you mean, I was tentative in my first forays into audio. I haven't yet been able to listen to new fiction in audio, but I love listening to re-reads of Heyer and Christie, factual and self-help books. I hope you enjoy both of these books when you listen to them! I have not listened to audio as much in my retirement as when I traveled on my job. But I do use audible while taking my 1/2 hour walk in the mornings. It is a slower read that way but it works. This story sounds intriguing - Caroline's appearance was amusing to read about and her personality has maintained all the sharp edges. Thank you SM. Yes, I have discovered two "treasures" in Amanda Berry (the voice of The Bennet Wardrobe) and Barbara Rich (the voice of the Lessers and Betters stories). I like to listen to audiobooks on my commute so I’m glad to see many of my favorite authors releasing their titles on this format. Hey DB...I am hoping the experiment of Audible adds a remarkable new dimension to bring the books to life. Appreciate your continued support. Hi Darcybennett. I think it's so great to see authors branching out into new formats. We are so lucky to have such choice! As Ceri says above, I've been waxing lyrical about the virtues of audiobooks for some time. I listen to mine when I'm driving, cooking, gardening, decorating (if I paint something such as a wall or door whilst listening to an audiobook, then that object is forever associated in my mind with that book) and even if I need help getting off to sleep (Stephen Fry reading the Harry Potter series is my "drug of choice" for the latter). It's amazing how listening to an audio narration or performance can bring out nuances in the text that you simply just don't pick up on when reading the text. While quite a lot of what I listen to is Austen or Austenesque fiction, it's not the only genre by any means. What I have found is that the choice of narrator/performer is vital. I've heard some horrors over the years and there are some who will prevent me from spending one of my Audible credits, no matter how much I'd like the book. Amanda Berry and Barbara Rich are names new to me and I feel sure that Don will have chosen wisely. It's such good news to hear that Don is joining a growing number of Austenesque authors in venturing into this new medium. Good Morning...what a wonderful reply! Yes, both Amanda and Barbara came to me through the #Audible audition process. Part of my job, I have discovered...being married to a former television producer/director...that I need to have a clear vision of how I want my books to "sound." T'is much the same as when I decide how I want my books to "look" when read. I have been known to fool with spacing, type placement and the like in order to attempt to give the reader a sense of dislocation, otherworldliness, and so on. Thank you, too, for using the term "Austenesque!" Thanks for the reply, Don. You're actually the person responsible for me using that term, following on from a post of yours I read elsewhere (sorry can't remember which blog it was). I haven't used the other term since! 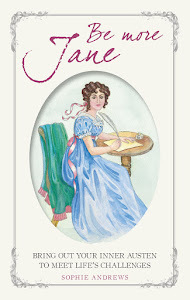 Anji...thank you for the credit on Austenesque. This came from one of my regular posts in Austen Authors. Amanda, I've listened to your sample of Henry Fitzwilliam's War and it sounds pretty good to me! I listen to audios often on my commute and I find I am reminded of stories when I am in particular places, especially when I've been caught in slow traffic and have built an association between the audio and a place! I loved your comments Don, and I agree with your opinion about audiobooks. I'm waiting for the whole The Bennet Wardrobe series to come in audio, so I can listen to it together. Thanks for the generous giveaway. Welllll....That requires me to get the last three main novels written! No, seriously, thank you! LOL, I have trust in you Don. That's the only thing with a series isn't it, Kate - whether to read and potentially forget details, or to wait for the series to be complete and have the pain of waiting! I have been writing Austenesque fiction since 2015. The Bennet Wardrobe stories began to emerge first followed by the Lessers and Betters stories afterwards. Four main books and two novellas in BW. 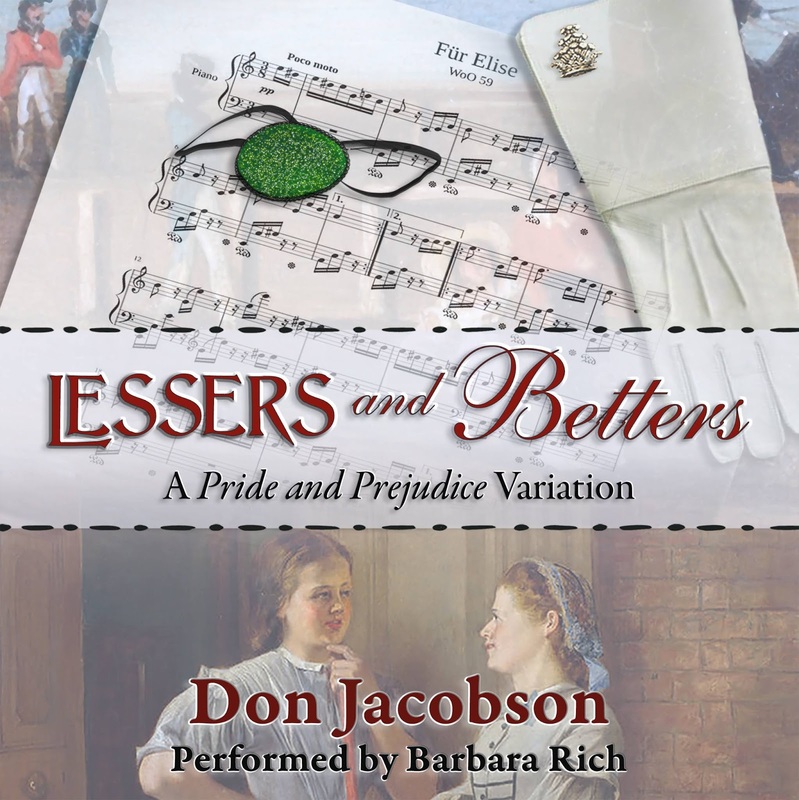 Lessers and Betters is available in Audible. The Wardrobe is coming out now...over the next several months. Absolutely, Sofia! Audiobooks can whisk you away when you're not able to actually read. I have relied on them so much in the past few years, especially when I've been busy and unable to carve out much reading time. Wouldn't these be a pleasure to win! Morning...we also have released "Lessers and Betters" on #Audible. Barbara Rich's performance adds so much to the paired novellas. Good luck on the give-away! Hi there Betty. Good luck in the giveaway! I've never listen to audiobooks before but I'm willing to give it a try. Thank you for listing down the benefits of audiobooks, Ceri. And Don, I enjoyed your enlightening guest post on the state of audiobook performances in the publishing world. I think this is the first time I hear that the written books are slightly different than the listening product. Hi Luthien, it's the first I've heard of audios differing from the text book too, aside from abridged versions of course. I hope you enjoy audios when you give them a try. Please recall that the differences are slight, but are designed to encourage listening pleasure and clarity of theme. The edits above were made to facilitate the 5 minute sample by offering a complete scene rather than a truncated arc. Is this giveaway international? Also, if it isn't, can I find The Bennet Wardrobe novella in Italy? 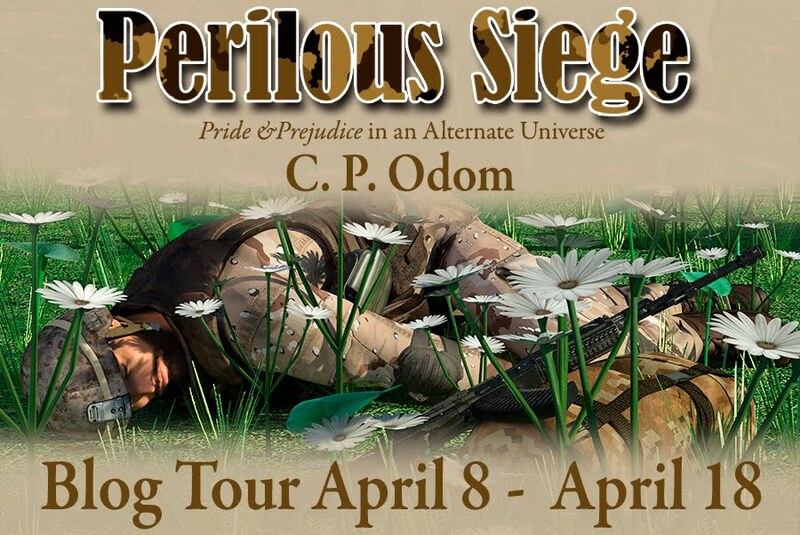 Hi...Audible is US/UK. I know some of my EU readers/listeners have accounts in Audible UK. As for the books, I just checked Amazon.it and found them. In English. Thank you Don, I will check if I can have two Audible accounts. Thank you Ceri! I already love the first two volumes in the serie!